A large number of commercial high-rise buildings in India now have external glass curtain walls. Such buildings require constant maintenance, This is highly dangerous work which should be carried out by cleaners using Suspended Cradle System with a Cradle suspended f rom the roof whi ch replaces conventional scaffoldings. The system can be used for external brickwork, plastering, painting, finishing etc. Lokpal industries offers such sophisticated systems consisting of an electrically operated Hoisting machine incorporating a ‘a’ cable guidance system and Anti Inclination safety locks as well as Speed Limit safety locks. These are available upto 800kg capacity. 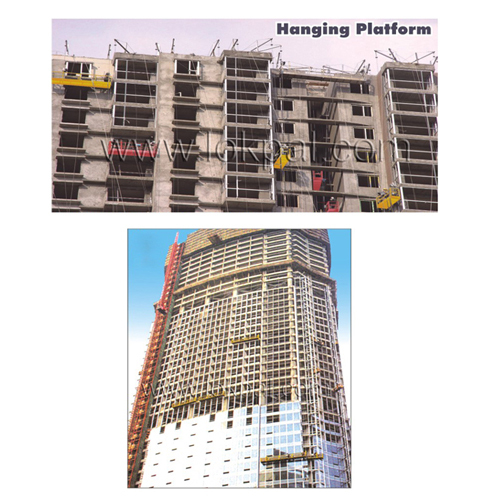 These Cradle systems are easy to install on the roof of the building. The height of the suspension Jib, as well as the projecting length (front beam) is adjustable so the system can easily adapt to different Facades and Fascia's as well as roof structures. Special systems can be designed to suit the users non standard requirements. 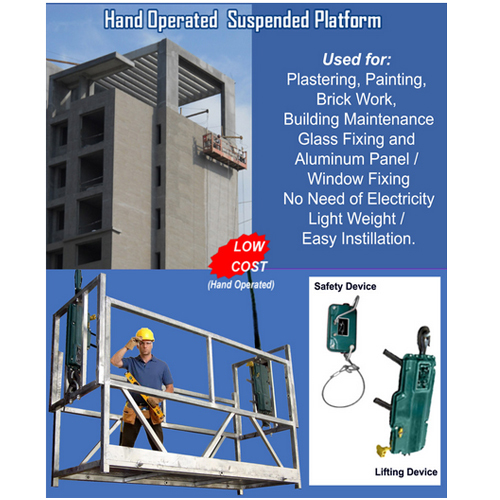 Hand Suspended Platform used for plastering, Painting, Brick Work, Building Maintenance, Glass Fixing and Aluminum Panel / Window Fixing. No need to electricity light weight / easy installation. The New Foot Pedal Suspended Hanging Platform does not require any electric connection and works simply by pedalling similar to pedalling on a cycle. It is available in standard length of 2/4 meters x 600mm width. The system incorporates a 4 wire rope system. 2 Ropes are for the Pedal Hoists and 2 are for the rope safety lock. The Platform capacity is 350 Kg. Each Pedal stroke lifts by 30mm (Approx.) and under normal working conditions 2 Persons can easily lift/ lower 5-6 meters/ min. The foot Pedal Suspended Platform is very suitable for use for Plastering, Painting, Glass Cleaning & Spray painting of Exterior building walls etc. It is very convenient to move from one place to another. 2 persons can easily assemble/ disassemble the complete equipment. It is easy to store and safe to use. 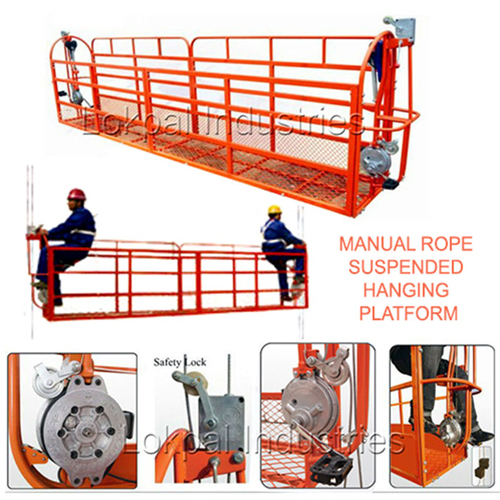 This equipment is also known as Foot Pedal Operated Suspended Platform, Hanging Platform, Foot Pedal Rope Suspended Platform, Foot Pedal Cradle System, Hand Cradle System and Manual Rope Suspended Platform.